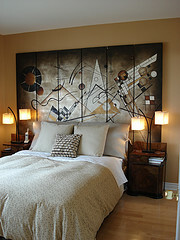 Wall hangings have a significant impact on the comfort and feel of your bedroom. Deciding how to decorate your bedroom walls starts with finding a theme and getting hold of wall hangings that are calming, peaceful and a reflection of you! Quilts are popular as wall hangings for good reason. They are beautiful works of art and tend to blend well with other bedroom decor decisions. You don’t have to go traditional with quilt patterns, either. 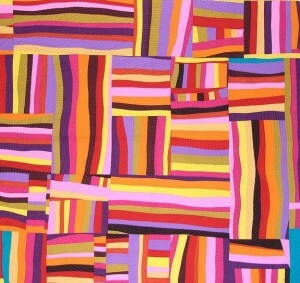 There are thousands of unique patterns out there as well as people who can create a quilt to your specifications, whether you want something old fashioned or a quilt with a science fiction theme. Hanging pictures is another way to go. Create a series family photos or nature photos in black& white or sepia to give it that warm, old charm. Place them in similar frames. These can be arranged in a grid, staggered all over a wall, or in a neat arrangement. Don’t worry if you can’t find a dozen of the same photo frame, either. 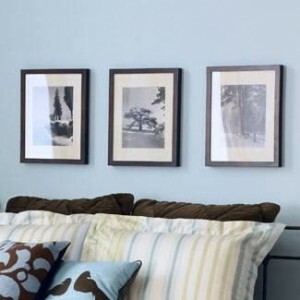 Try visiting a garage sale and use an assortment of antique frames for a more quirky look. Whether you decide on traditional, 2-D paintings or the highly textured works of canvas art that are growing in popularity, it is important to keep a piece of art within your bedroom’s style and color palette. Choose paintings that have at least two colors in common with your bedroom’s decor and it will feel like a part of the room rather than an afterthought. When it comes to bedrooms, the decor is arguably the most important decision. While the comfort level of the room is high up on the list, the appearance of your boudoir is a part of this comfort. If what you are looking at is not pleasing to your eyes, you will be less likely to spend extra time enjoying what is supposed to be the most enjoyable room of your home.